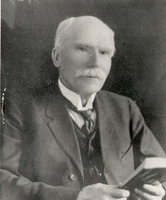 CRAMP, JOHN MOCKETT, Baptist minister, author, and educator; b. 25 July 1796 at St Peter’s (St Peter Extra), Isle of Thanet, England, son of Thomas Cramp and Rebecca Gouger; m. first 25 Sept. 1820 Maria Agate, and they had one daughter; m. secondly 1 Feb. 1826 Anne Burls, and they had eight children, one of whom, Thomas, became a prominent Montreal businessman; d. 6 Dec. 1881 at Wolfville, N.S. John Mockett Cramp was the son of a Baptist minister and was baptized and received into his father’s church in September 1812. He was educated at Canterbury and then, for three years, at Stepney Theological Institute in London. On 7 May 1818 he was ordained minister and took charge of Dean Street Baptist Church, Southwark (now part of London); until 1844 he held pastorates in several parts of England. Cramp, however, was by inclination more the scholar than the pastor. His reading was both catholic and voluminous and was reflected in his writings. His first sermon was published in 1819 and he wrote extensively for most of the rest of his life – sermons, church history, biography, theological works, and hundreds of newspaper articles. From 1825 to 1828 he edited the Baptist Magazine and he became a partner in a publishing business, a venture that ended in financial disaster. His growing reputation as a Baptist scholar led in 1844 to the offer of the presidency of the Canada Baptist College in Montreal, operated by the Canada Baptist Missionary Society. In spite of Cramp’s efforts to establish the struggling college on a sound financial and scholastic footing, it collapsed in 1849 because it lacked strong denominational support. During his presidency, Cramp edited the Montreal Register and, after 1849, the Colonial Protestant, and Journal of Literature and Science and the Pilot. Cramp also took an active part in the affairs of both the denomination and the colony. He early became interested in the efforts of Henriette Feller [Odin*] to evangelize French Canadian Catholics, and in both Canada East and the Maritimes forged permanent links between Baptists and Madame Feller’s Grande-Ligne mission. In 1850 the board of governors of the newly formed Acadia College, the Baptist institution of higher learning opened early in 1839 in Wolfville, N.S., selected Cramp as president to succeed the Reverend John Pryor*. 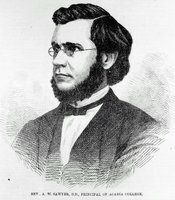 When he arrived at Acadia in June 1851, Cramp found the college on the verge of collapse, having only one professor, Isaac Chipman, few students, and no money; the Baptist community in the Maritimes had decided in 1850 that it was inconsistent with their advocacy of the separation of church and state to accept further government grants for Acadia College. Cramp, however, energetically set out to revive the institution and earned for himself the title “second founder” of Acadia. He launched a successful campaign among Maritime Baptists for endowment funds to provide a sound financial base for the college. 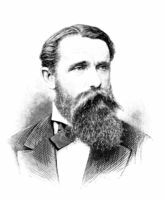 In addition to his duties as president Cramp taught classical languages, history, philosophy, theology, logic, political economy, and even geology. His activities outside the college were equally wide ranging: he delivered a monthly public lecture, preached every Sunday evening, acted as unofficial assistant pastor of the Wolfville Baptist church, became actively involved in the temperance movement, edited the Abstainer, and the Athenæum, and Journal of Temperance, and still found time to read extensively and to write. That Acadia College survived the disastrous 1850s is largely a result of Cramp’s efforts, but his early years at Acadia were disappointing for him. He wrote sadly in his journal that “My services in the College were not so acceptable as I had hoped, and there was, besides, a strong desire for the return of [Edmund Albern Crawley] to the College.” Crawley, Acadia’s founder and a professor there until his resignation in 1847, would, however, return only as president, so Cramp resigned his post in September 1853 to assume a position created for him as principal of the theological institute of the college. The major emphasis at Acadia remained, however, the education of laymen, who during Cramp’s years at the college were twice as numerous as those studying theology. It must have been with some bitterness that Cramp watched as Crawley mismanaged the newly established endowment fund, losing £3,410 (nearly one-third of the total) in mining stock speculation. After Crawley’s resignation in September 1856, Cramp was appointed “chairman of faculty” and finally reappointed president on 18 Jan. 1860, a post he occupied until his retirement in 1869. It was during Cramp’s second term as president that Acadia was placed on a secure footing. The college’s endowment fund was enlarged to guarantee the salaries of the professors, and enrolment rose sharply. Cramp was able to attract able professors, among them James De Mille*; Crawley returned to teach in 1866. Cramp spent his years of retirement actively furthering the interests that had preoccupied much of his life. Among his many published works are Paul and Christ! A portraiture and an argument (1873) and A memoir of Madame Feller, with an account of the origin and progress of the Grande Ligne mission (1876). He also wrote extensively for newspapers and magazines in both North America and Britain. Throughout his life one of the major forces in Cramp’s thought was his aversion to tyranny and oppression, in whatever form they might appear. The “tyranny” imposed by rum would thus be opposed as strongly as political or military oppression. These same fears were the basis of his strong anti-Catholicism. His study of history, and especially of the Reformation, had led him to conclude that “Popery is friendly to that arbitrary power of the state, which it exercises in the church; and where its influence is unrestrained, free institutions cannot prosper.” According to Cramp, “The popish system is a grand conspiracy against the authority of Christ and the rights of men; it tends to universal slavery, crouching man’s industry, fetters his mind and corrupts his morals.” For him, the lines were clearly drawn between ignorant superstition on the one hand and intelligent Christianity on the other. Catholicism, then, “must be swept from the face of the earth.” His roles as writer and educator clearly were defined by his strong desire to free men’s minds so that higher goals could be attained. His strongly held views often led him into controversy over such issues as public schooling, temperance, the Jamaica rebellions in 1865, and Baptist missions to Catholic communities. His success in his chosen role of educator can be best measured by the prominence of the students who graduated from Acadia during his years there. Ministers such as Edward Manning Saunders*; educators of the calibre of Theodore Harding Rand* and Charles Frederick Hartt*; lawyers and politicians such as Sir Robert Linton Weatherbe*, Wallace Graham*, and Neil McLeod* all attest to the fact that Cramp’s emphasis on education brought tangible results beyond even his expectations. Thus it is his work as an educator that remains Cramp’s chief claim to recognition. Acadia Univ. Arch. (Wolfville, N.S. ), Acadia College endowment, List of subscribers, 1 Jan.–20 Sept. 1853; Board of Governors, Minutes, I, 1850–83. Atlantic Baptist Hist. Coll., J. M. Cramp, Journal (typescript). [S. W. DeBlois], Historical sketch of the 1st Horton Baptist Church, Wolfville, for the period of one hundred years, from A.D., 1778, to A.D., 1878 (Halifax, 1879). The Acadia record, 1838–1953, comp. Watson Kirkconnell (4th ed., Wolfville, 1953). Canadian literature in English, comp. V. B. Rhodenizer (Montreal, 1965), 331–32. The Baptists of Canada: a history of their progress and achievements, ed. E. R. Fitch (Toronto, 1911). I. E. Bill, Fifty years with the Baptist ministers and churches of the Maritime provinces of Canada (Saint John, N.B., 1880). A. C. Chute and W. B. Boggs, The religious life of Acadia (Wolfville, 1933). 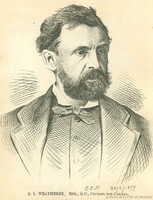 T. A. Higgins, The life of John Mockett Cramp, D.D., 1796–1881 . . . (Montreal, 1887). Jubilee of Acadia College, and memorial exercises (Halifax, 1889). G. E. Levy, The Baptists of the Maritime provinces, 1753–1946 (Saint John, 1946). R. S. Longley, Acadia University, 1838–1938 (Wolfville, 1939); The Wolfville United Baptist Church (Kentville, N.S., 1954). E. M. Saunders, History of the Baptists of the Maritime provinces (Halifax, 1902). Sons of Temperance of North America, Centennial, Sept. 29th 1942: the pioneer total abstinence order of North America, 1842–1942: one hundred years of service ([Halifax, 1942]), 126, 191. Barry M. Moody, “CRAMP, JOHN MOCKETT,” in Dictionary of Canadian Biography, vol. 11, University of Toronto/Université Laval, 2003–, accessed April 20, 2019, http://www.biographi.ca/en/bio/cramp_john_mockett_11E.html.